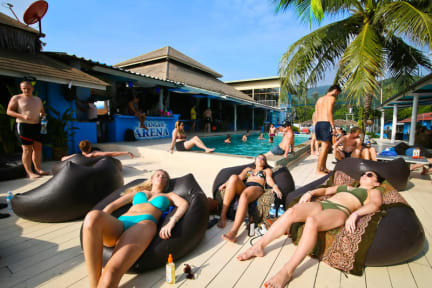 Arena Hostel has the best facilities and social life in Koh Phangan!! The bar is lively and always has something fun happening, the food is cheap and delicious, the pool/beer pong/football pitch/FIFA are awesome, and the overall vibe is so much fun here. My group was staying at a few hostels for Full Moon and we all extended our stay to spend more time at this hostel. The staff are so fun and friendly, especially Aom in reception and everyone in the bar - can’t recommend Arena enough! This place is super amazing! The best hostel that I’ve stayed at. It has a basketball court, soccer pitch, pool tables, table tennis table, bar, video game (fifa) station. It pretty much has everything you need. Tristen that works in the reception area is also a cool dude. I recommend it 100%, the staff was so friendly and fun. Best place to party on Koh Phangan. I would definitely stay here again!! Great place to stay, all the staff are spot on and know how to treat guests the right way! Would definitely come back here in the future. I’ll be back to claim my beer pong crown one day 🙌🏼. Second time I have stayed at this amazing hostel. Extend my stay because I enjoyed the events. Rozie is the friendliest staff member I have ever Met. Really informative as well as great company, was the host of many fun events. Would recommend! Great hostel to stay at for the full moon and surrounding parties! Pregame events for all of them. Party hostel for sure, if you want to meet people and drink quite a lot then it’s great for that. Quite a good location with restaurants near by.